* . . . . At last the doctor will be freed from the tedious interpretation of screens and photographs. Instead, he will examine and scan through his patient directly. Wearing optical-shutter spectacles and aiming a pulsed laser torch, he will be able to peer at the beating heart, study the movement of a joint or the flexing of a muscle, press on suspect areas to see how the organs beneath respond, check that pills have been correctly swallowed or that an implant is savely in place, and so on. A patient wearing white cotton or nylon clothes that scatter but hardly absorb light, may not even have to undress . . . . *. 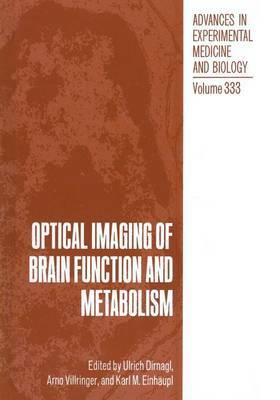 David Jones, Nature (1990) 348:290 Optical imaging of the brain is a rapidly growing field of heterogenous techniques that has attracted considerable interest recently due to a number of theoretical advantages in comparison with other brain imaging modalities: it uses non- ionizing radiation, offers high spatial and temporal resolution, and supplies new types of metabolic and functional information. From a practical standpoint it is important that bedside examinations seem feasible and that the implementations will be considerably less expensive compared with competing techniques. In October 1991, a symposium was held at the Eibsee near Garmisch, Germany to bring together the leading scientists in this new field.